The first one – VCAP 6 – Datacenter Virtualization Deployment and VCAP 6 – Network Virtualization Deployment. That’s mean that all VCAP 6 exams are now available in GA version for everyone. However there is an inconvenience for some countries if you live for example in Poland. 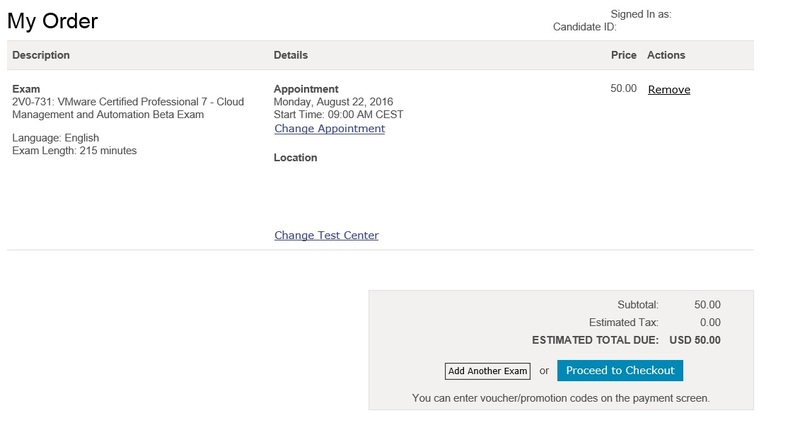 Unfortunately there is no Pearson Vue test Center in Poland where you can take the exam..Anyway I believe that VMware/Pearson Vue will change it soon. But what about the VCP7-CMA ? It’s a really funny story, because it you try to find anything about it searching the Internet you will not! There was no announcement on VMware site, any information at VMware Education blog, etc. So, what exacly am I talking about? Due to my frequent verification of Pearson Vue site to check if the deployment exams are already available I discovered VCP7 exam recently. As I said, it’s quite strange that there is no information about it but as you can see below it does not seem to be a bug. Time for VCAP6-DCV has come! It’s high time to start our journey to VCAP 6 Data Center Virtualization Deployment exam! I saw few blogs with consolidated materials based on VMware Blueprint in the past. These materials covered VCAP5-DCA exam. Unfortunately, there is no such bible to VCAP6-DCV, I’ve just found a blog related to VCAP6-CMA exam. That’s why we as a team agreed to prepare such consolidated material in one place – on our blog. Even though there would be already such idea on the Internet, we would not change our mind. The reason is pretty simple – I believe it will be the best way to study the whole material and prepare ourselves to pass this exam. Furthermore, I hope it will help others as well..